You Don't Have to be Rich to Live Like the Wealthy! We have the equipment, products, and accessories to spoil you rotten. Nothing beats the comfort of a heated towel! The wonderful idea of a warm towel now appeals to more and more homeowners. Why not treat yourself to the luxury of having heated towels? 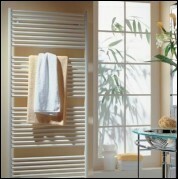 There is a great variety of heated towel racks to choose from that will fit most any budget. Hydronic towel warmers are connected to the hot water heating system and can be set to warm anytime the home is heated. They can even be used in warmer weather and are great for cold bathrooms! Life is short - stay comfortable! You will never have to shovel or salt again. Ever! 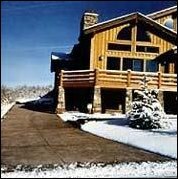 Our custom designed snow and ice melting systems provide a simple, reliable and economic solution for snow removal. A gas or oil hot-water boiler circulates warm water through PEX tubing buried in concrete, turf, asphalt, or a sandbed. The warm water heats the surface to a temperature where it is warm enough to melt away snow and ice. This makes the worry and inconvenience of snow and ice removal a thing of winters past! Never shovel or salt again! Few finishes offer the warmth & elegance of brass! 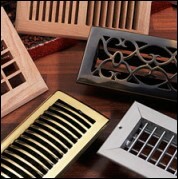 We offer a collection of high quality registers, grilles, and diffusers in classic designs and finishes. Besides looking good, they are engineered for minimum air resistance, resulting in quieter performance and optimum comfort. Choose from: Polished or Antique Brass, Finished or Unfinished Hardwood, and assorted styles and finishes. Have your Specialty item professionally installed today!